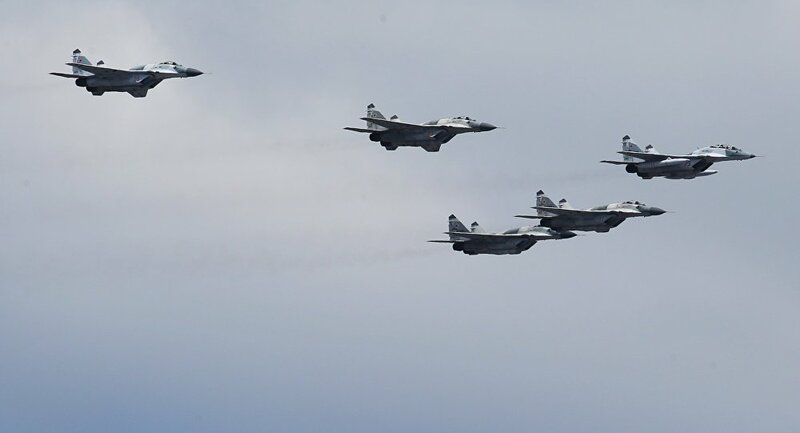 Russia plans to transfer six Mikoyan MiG-29 multirole fighters to Serbia as part of a military and technical cooperation program, with defense analyst Aleksandar Radic telling Sputnik that Belgrade "urgently needs" these military aircraft. Under the deal, the Balkan nation will also receive 30 T-72С tanks and 30 BRDM-2 amphibious vehicles. "The four MiGs in Serbia's arsenal which are currently stationed at the Batajnica air field increasingly require maintenance," the Serbian analyst said. "At the moment the MiG-29s [which Russia will deliver to Serbia] are a salvation for our air force. They will help us maintain constant alert as part of air defense. This is a duty which has to be carried out 24/7. This is a national and international duty for us, as well as training for our pilots." Serbian Prime Minister Aleksandar Vucic issued a statement on the deal with Russia on Thursday following an informal meeting with Russian Defense Minister Sergei Shoigu. The delivery is expected to take place in March — April 2017. In November, defense analyst Miroslav Lazanski told Sputnik that Serbia will receive Russian-made military hardware at a huge discount, with Belgrade only covering repair costs. Retired colonel Dragan Krsmanovic noted that Russian planes will strengthen Serbia's defense capabilities. "Any modernization, particularly when it comes to air force and air defense, matters. I am refereeing to the latest deal and the ones that will follow, which could include the Buk missile system. This could drastically improve Serbia's defenses," he told Sputnik. "However, we should not forget that national defense is a comprehensive system. If a single component of this system changes, it does not mean that the entire system will be automatically improve." The deal prompted journalist Evgeny Krutikov to assert that Serbia has become Russia's key defense partner in the Balkans. "One could say that due to these deliveries Russia has returned to the Balkans with regard to military cooperation. And clearly it is impossible to imagine a similar deal with other countries in the region, like Bosnia and Herzegovina or Montenegro," he said. "Boosting defense ties with Russia is extremely important for Serbian authorities, mainly in the context of the upcoming presidential election in 2017 and the possible snap parliamentary elections."